While physical activity might be the last thing on your mind when dealing with the aches and pains of arthritis, it can actually be a great help. For arthritis sufferers who are constantly coping with aches and pains, getting more physical activity isn’t always at the top of the to-do list. It’s normal to want to forgo physical activity in favor of more rest, but that might not always be the best option for an aging body. Exercise is one of the best ways to increase quality of life and boost mood. When suffering from arthritis pain, sometimes that does mean moving more often and being more physically active, even if it sounds like it would do more harm than help. When a doctor recommends increasing exercise, it doesn’t mean training for a marathon—or planning to swim a mile tomorrow. It means starting slow and creating a plan with the goal of optimal health. Working with your Senior LIFE team on a care and exercise plan can help ensure a high quality of life, even if arthritis is present. The Senior LIFE medical team works tirelessly to ensure your loved one’s quality of life. The thought of exercising with arthritis can be daunting, but it doesn’t have to be. Even basic movements can make a big difference in improving a person’s mobility and easing aches and pains. Read on for a look at why physical activity is beneficial for those with arthritis, some exercise ideas, and how Senior LIFE can help. Exercising is often one of the top recommendations by doctors for people suffering from arthritis. And for good reason! Exercise strengthens the muscles around joints, helps maintain bone strength, and makes it easier to get a good night’s sleep. It can also increase range of motion, one of the most pressing concerns for those who have arthritis. A doctor or physical therapist can recommend the best exercises for reducing arthritis pain and decreasing stiffness. But how can you know if what your provider is recommending is the best strategy? With the team of medical experts at Senior LIFE, all aspects of care—from medications to exercise—are discussed and determined by a dedicated team. That means multiple people play a role in deciding what will work best for a member’s individual needs. What Is the Best Exercise for Arthritis? That’s really a trick question! There is no single best exercise for arthritis. Finding the right exercise routine requires a little bit of experimentation to see what helps you and what you enjoy. Some exercises are better than others when it comes to your joints. You want to look for activities that include gentle, range-of-motion movement. Simple stretches that can be done in the home will help increase flexibility, improve joint rotation, and alleviate hip pain. Slowly lowering down into a chair is a method used to help combat arthritis pain in the wrists, hands, arms, and shoulders. 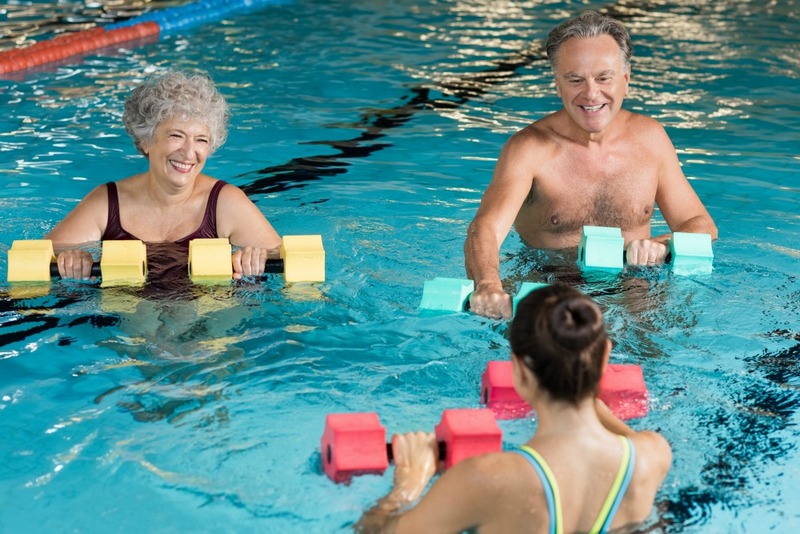 Water exercises are among the best for those with any type of arthritis. While swimming, water jogging, and other water workouts are beneficial for almost anyone, individuals suffering from arthritis can find great relief in the water. Water removes the pressure from joints and allows for a greater range of motion along with resistance training. Yoga is another great exercise for arthritis. Most yoga classes and poses are extremely low impact, which is a great benefit for those with arthritis. When getting started with yoga, you want to take time to learn how to correctly perform the movements, so that you ease your aches rather than adding to them! Walking is a common exercise for arthritis. Walking, even just for a few minutes at a time, strengthens leg muscles, builds endurance, and stabilizes joints—which are all helpful for those with arthritis. Pilates, low-impact aerobics, and moderate dance classes like Zumba are other exercises that are especially beneficial for people that suffer from arthritis. At the Senior LIFE Health and Wellness Center, our members are able to participate in physical activities, work one-on-one or in a group with physical therapists, and access a variety of medical and support services. If your loved one suffers from arthritis, it’s important to get the necessary care to maintain and even improve quality of life. Exercise can often help with pain management and is a vital part of many arthritis care plans. Contact the professionals at Senior LIFE to learn what can be done for your loved one’s arthritis pain. Our team of medical experts will work with your loved one to include exercise and rehabilitation in his or her care plan and suggest appropriate activities.